The current V7 release of Zoom is fully compatible with Dreamweaver. Click here for more information on V7. The Dreamweaver Extension below is no longer required and has been discontinued. Zoom V6 can be installed as a Dreamweaver Extension. This allows you to index and manage your site's search engine directly from the popular web development environment, Macromedia Dreamweaver. The best way to add a search function to a site created with Dreamweaver! This is a MXP file and must be installed with the Macromedia Extension Manager. See the Installation instructions below. The V6 extension is an interface in Dreamweaver which launches Zoom and pre-load your Dreamweaver project settings into Zoom. It will automatically install the full Zoom Search Engine package that you can download elsewhere on this site. Should you wish to update to Zoom to the latest version and build available, V7, you can simply download the full update from our main Downloads page and the extension will also be updated. After downloading the MXP file, start up Dreamweaver, click on the the "Help" menu, and select "Manage Extensions..."
This will open the Macromedia Extension Manager window. Click on "File" and select "Install Extension...". Now locate the MXP file you have downloaded and click "Install". Proceed with the following steps that appear. When the installation has completed, you should see something like the following screenshot. You will have to restart Dreamweaver for the installation to complete. Under the "Commands" menu in Dreamweaver, there are two new options: "Index site with Zoom Search Engine" and "How to create a Search Page for your site". 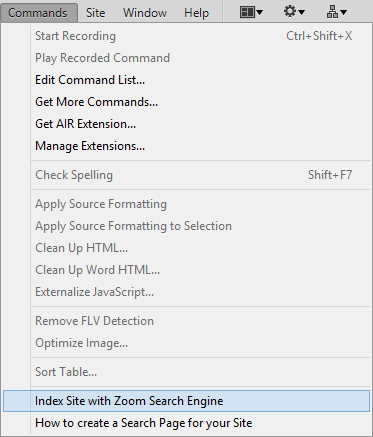 Selecting "Index Site with Zoom Search Engine" will start the Zoom Indexer. You use this to scan through the contents of your site to create the files required for the search engine. You also use this to update your search engine when you make changes in your website. The Indexer lets you select from Offline mode or Spider mode. Spider mode is used to index your online site, and the content of the files already uploaded to your web site. Here you will have to enter a Start Spider URL for it to begin, usually this is the front page of your site (eg. http://www.mysite.com/index.html). The output directory is defaulted to your Dreamweaver Site settings. Offline mode is used to index the local files of your site, sitting on your computer's hard disk. This includes pages and files you have not yet uploaded to your web site. The start and output directories are defaulted to your Dreamweaver Site settings. We recommend you use Zoom's FTP functionality because some FTP clients (such as Dreamweaver's) may incorrectly upload the files in Text mode. All files should be uploaded in Binary mode. This is just the tip of the iceberg! There is a myriad of options you can choose from to enable highlighting, sorting by dates, categories, and much more. Now that you have a working search page however, you can pry deeper into Zoom's settings. Everything from colours, fonts and page layout, to the text messages that appear can be changed to your liking. More comprehensive information about using and configuring your Zoom Search Engine can be found in the Users Guide which is available as a free download. The Zoom Dreamweaver Extension is the same as the stand-alone product, and is available in the same variations: Free Edition, Professional Edition, and Enterprise Edition. A purchased license for Zoom will apply for both the stand-alone product and the Dreamweaver Extension. Buy now! If you have problems with using or installing the Dreamweaver Extension, please check our FAQ page for Dreamweaver here. Plugins are available for the registered editions of Zoom, which enables support for searching PDF, DOC, XLS, PPT, and other document formats. See the plugins page for more information. 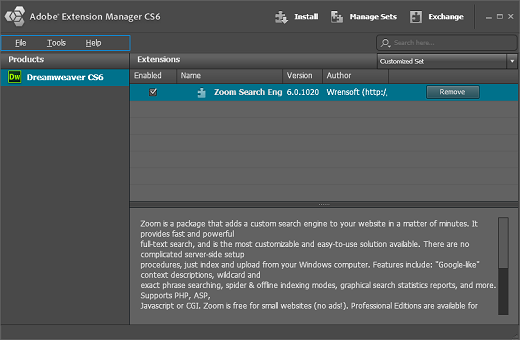 While the extension is not supported in Dreamweaver CC, you can still use Zoom to create a search engine for your site. Zoom is easy to use and highly customizable. Be sure to visit the tour and give the free edition a try.